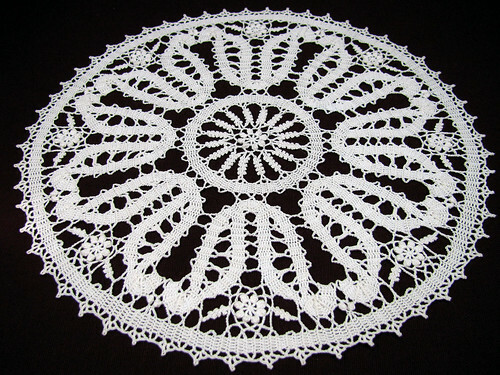 This is another doily done in size 30 DMC Cebelia thread. The design is a stylized tulips, but from this angle it is a little hard to see them. It is a pretty easy pattern to make. I like the rows of double picots that form the center and leaves for the flowers around the edge. I’ve come to realize that I am drawn to lace designs that have ribbons flowing through them. Laces such as Bruges, Battenberg, Romanian point, and if I can find another style, that too. Now I just need to find time to learn some needlelace stitches. This entry was posted on Wednesday, November 12th, 2008 at 3:00 am and is filed under Crochet and Lace. Tagged: Crochet, Doily, Lace, Thread. You can feed this entry. You can leave a response, or trackback from your own site. that is absolutely gorgeous!! I learned a little crochet this past year, won’t be trying thread crochet any time soon I assure you!